The Diamond Jubilee tour continues — next stop Jamaica! But Prince Harry’s schedule had to be changed slightly to honour the British soldiers believed to have died on Tuesday. Prince Harry‘s Caribbean tour in honour of Queen Elizabeth‘s Diamond Jubilee had to be toned down a bit, out of consideration for the six British soldiers reported to have died on Tuesday in Afghanistan. According to Britain’s Ministry of Defence, the soldiers are believed to have perished when their armoured vehicle was hit with an explosion in southwestern Afghanistan. If confirmed, this would be the biggest loss of life for the British army, since the 2006 plane crash. The Prince — who is a British Army captain and an Apache attack helicopter pilot — had to alter his schedule and abstain from participation in any military activity to respect the deceased British soldiers. Instead, he enjoyed a day at a Jamaican military camp watching other soldiers show off their skills. Must have been tough, but he did it. Harry could not resist some target practice, however. He hit the Jamaica Defence Force’s Up Park Camp dressed in camouflage, looking all kinds of good-lookin’, and fired rounds from an M4 rifle, scoring 39 out of 40 on two targets. Look at that, beauty and skill — perfect combination. The Prince visited the Bahamas and Belize earlier, and is set to depart Jamaica on Thursday. He’s heading to Brazil next, hoping to promote ties and smooth the transition from the 2012 London Games to the 2016 Olympics in Rio de Janeiro. Work that charm, boy! Smooth them eyebrows and flash that smile. 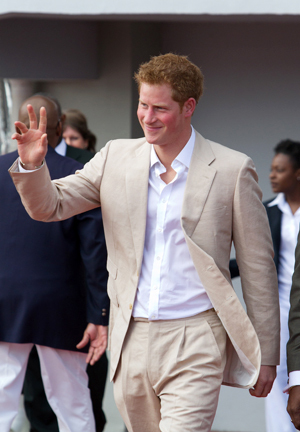 This week is just a wonderful Prince Harry photo fest…. Oh, tears of happiness! Of course, our respects to the families of the missing soldiers. Godspeed!